A documentary film co-produced by the audience. The documentary produced by the audience has conquered RAI TRE! That’s what they want us to believe in Italy. It’s time we give a voice to Italian LGBT-headed families. It’s time we give a voice to their children. Those same children who should not even exist. “Il lupo in calzoncini corti / The Wolf in Shorts” is about them. There’s more to it. We’ll hear their stories in their own words, staged in this doc film which documents the everyday life of a couple of these families and children in a span of two years. 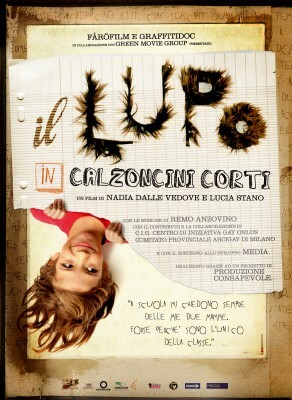 Now you can hear them, the children, in the first Italian movie produced with the financial support of the AUDIENCE! Advance sales are over now, since they were meant only to produce the movie. We have hit the goal, and the movie will soon be available in bookstores! Sign up for fresh news today! Subscribe to our newsletter! In the summer of 2009, over a year before the movie was completed, we asked the audience to participate in production. All of us, part of the audience, supported the project and decided what contents should be taken in and what should not. Participants helped us uncover stories of everyday discrimination, portraits of an invisible country. For over a year we have tried to track down a kind of audience who wished to give up their role as final links in an assembly line and pick up an active one, wielding their decision-making power. A kind of audience which could participate in production by buying the DVD in advance, before the doc was completed. We sold DVDs at 14 euros each, to enable the film to be included in TV program schedules within the end of 2010. 14 euros to knowingly and directly participate in the production of a documentary which would show Italian people what our politicians deliberately ignore. IT WORKED!! Thanks to the support of 550 friends who believed in the project, the doc has crashed the barriers and landed on Rai Tre program shedule. The movie was aired on July 28, 2010 in Doc3, on the third national network. It’s a huge success for an indie production having a much debated subjet. Soon “The Wolf in Shorts” will be aired in movie theatres all over Italy, and thanks to the energy boomed by the audience, it will soon be marketed through large-scale retailers and made available to hundreds more people. For updates news stay tuned, we’re still working on this and we don’t want to say anything more for good. 2011 is the year of the Wolf, STAY TUNED! The Wolf is now wagging its tail and setting off on its long journey! !